Sesame (/ˈsɛsəmiː/; Sesamum indicum) is a flowering plant in the genus Sesamum, also called benne. Numerous wild relatives occur in Africa and a smaller number in India. It is widely naturalized in tropical regions around the world and is cultivated for its edible seeds, which grow in pods or "buns". World production in 2016 was 6.1 million tonnes, with Tanzania, Myanmar, India, and Sudan as the largest producers. Sesame seed is one of the oldest oilseed crops known, domesticated well over 3000 years ago. Sesamum has many other species, most being wild and native to sub-Saharan Africa. Sesamum indicum, the cultivated type, originated in India and is tolerant to drought-like conditions, growing where other crops fail. Archaeological remnants suggest Sesame was first domesticated in the Indian subcontinent dating to 5500 years ago. Charred remains of sesame recovered from archeological excavations have been dated to 3500-3050 BC. Fuller claims trading of sesame between Mesopotamia and the Indian subcontinent occurred by 2000 BC. Some reports claim sesame was cultivated in Egypt during the Ptolemaic period, while others suggest the New Kingdom. Sesame is an annual plant growing 50 to 100 cm (1.6 to 3.3 ft) tall, with opposite leaves 4 to 14 cm (1.6 to 5.5 in) long with an entire margin; they are broad lanceolate, to 5 cm (2 in) broad, at the base of the plant, narrowing to just 1 cm (0.4 in) broad on the flowering stem. The flowers are yellow, tubular, 3 to 5 cm (1.2 to 2.0 in) long, with a four-lobed mouth. The flowers may vary in colour, with some being white, blue, or purple. Sesame seeds occur in many colours depending on the cultivar. The most traded variety of sesame is off-white coloured. Other common colours are buff, tan, gold, brown, reddish, gray, and black. The colour is the same for the hull and the fruit. Immature or off-sized seeds are removed and used for sesame oil production. Sesame seed is a high-value cash crop. Prices have ranged between US$800 and 1700 per metric ton between 2008 and 2010. In a 100-gram amount, dried whole sesame seeds provide 573 calories and are composed of 5% water, 23% carbohydrates (including 12% dietary fiber), 50% fat, and 18% protein (table). Whole sesame seeds are rich (20% or more of the Daily Value) in several B vitamins and dietary minerals, especially iron, magnesium, calcium, phosphorus, and zinc (table). A meta-analysis showed that sesame consumption produced small reductions in both systolic and diastolic blood pressure. Sesame oil studies reported a reduction of oxidative stress markers and lipid peroxidation. In Asia, sesame seeds are sprinkled onto some sushi-style foods. 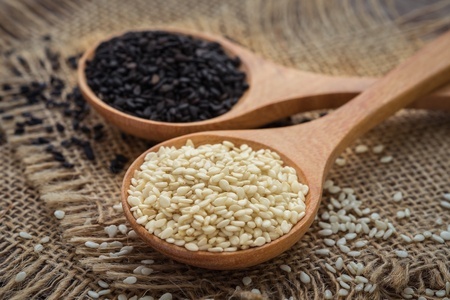 [clarification needed] In Japan, whole seeds are found in many salads and baked snacks, and tan and black sesame seed varieties are roasted and used to make the flavouring gomashio. East Asian cuisines, like Chinese cuisine, use sesame seeds and oil in some dishes, such as dim sum, sesame seed balls; Cantonese: jin deui), and the Vietnamese bánh rán. Sesame flavour (through oil and roasted or raw seeds) is also very popular in Korean cuisine, used to marinate meat and vegetables. Chefs in tempura restaurants blend sesame and cottonseed oil for deep-frying. Sesame, or simsim as it is known in East Africa, is used in African cuisine. In Togo, the seeds are a main soup ingredient and in the Democratic Republic of the Congo and in the north of Angola, wangila is a dish of ground sesame, often served with smoked fish or lobster. Sesame seeds and oil are used extensively in India. In most parts of the country, sesame seeds mixed with heated jaggery, sugar, or palm sugar is made into balls and bars similar to peanut brittle or nut clusters and eaten as snacks. In Manipur, black sesame is used in the preparation of chikki and cold-pressed oil. In Assam, black sesame seeds are used to make til pitha and tilor laru (sesame seed balls) during bihu. In Punjab and Tamil Nadu, a sweet ball called pinni in Urdu and ell urundai in Tamil, ellunda in Malayalam, yellunde/Chigali, (sesame ball, usually in jaggery), is made of its seeds mixed with sugar. It is eaten in various forms during the festival of Makar Sankranti. Also in Tamil Nadu, sesame oil used extensively in their cuisine, milagai podi, a ground powder made of sesame and dry chili is used to enhance flavor, and is consumed along with other traditional foods such as idli. In Tamil Nadu and Andhra Pradesh, sesame oil is used as a preservative, as well as to temper the heat of their spicy foods, pickles, and condiments. Sesame seed cookies and wafers, both sweet and savory, are popular in places such as Charleston, South Carolina. Sesame seeds, also called benne, are believed to have been brought into 17th-century colonial America by West African slaves. Since then, they have become part of various American cuisines. In Caribbean cuisine, sugar and white sesame seeds are combined into a bar resembling peanut brittle and sold in stores and street corners. Sesame is a popular and essential ingredient in many Middle Eastern cuisines. Sesame seeds are made into a paste called tahini (used in various ways, including hummus bi tahini) and the Middle Eastern confection halvah. Ground and processed, the seed is also used in sweet confections. Sesame is also a common component of the Levantine spice mixture za'atar, popular all throughout the Middle East. In South Asian, Middle Eastern, and East Asian cuisines, popular confectionery are made from sesame mixed with honey or syrup and roasted into a sesame candy. In Japanese cuisine, goma-dofu is made from sesame paste and starch. Mexican cuisine refers to sesame seeds as ajonjolí. It is mainly used as a sauce additive, such as mole or adobo. It is often also used to sprinkle over artisan breads and baked in traditional form to coat the smooth dough, especially on whole-wheat flatbreads or artisan nutrition bars, such as alegrías. In Sicilian cuisine, what are commonly called "Italian sesame seed cookies" are known as giuggiuleni . A giuggiulena usually refers to a cookie, while a giurgiulena usually refers to a nougat-like candy, often made as a Christmas food. Both are alternative spellings for "sesame seed" in the Sicilian language. Sesame oil is sometimes used as a cooking oil in different parts of the world, though different forms have different characteristics for high-temperature frying. The "toasted" form of the oil (as distinguished from the "cold-pressed" form) has a distinctive pleasant aroma and taste, and is used as table condiment in some regions, especially in East Asia. Toasted sesame oil is also added to flavor soups and other hot dishes, usually just before serving, to avoid dissipating the volatile scents too rapidly. Although sesame leaves are edible as a leaf vegetable, recipes for Korean cuisine calling for "sesame leaves" are often a mistranslation, and really mean perilla. Sesame seeds and sesame oil are a serious allergen to some people, including infants. In Australia, the occurrence of allergy to sesame seed was estimated to be 0.42% among all children, while in the United Kingdom, the allergic reaction was found to affect 0.04% of adults. The occurrence of allergy to sesame in patients with some form of food allergy was found to be much higher than in the general population, ranging from 0.5% in Switzerland to 8.5% in Australia. In other words, allergy to sesame affects a small percentage of overall human population, but sesame allergy is high in people who already show symptoms of allergy to other foods. At least one study found that "standard skin and blood testing for food allergies predict whether a child has true sesame allergy." In which case, a food challenge under the direction of a physician may be required to properly diagnose a sesame allergy. A cross-reactivity apparently exists between sesame allergens and peanut, rye, kiwifruit, poppy seed, and various tree nuts (such as hazelnut, black walnut, cashew, macadamia, and pistachio). In myths, the opening of the capsule releases the treasure of sesame seeds, as applied in the story of "Ali Baba and the Forty Thieves" when the phrase "Open Sesame" magically opens a sealed cave. Upon ripening, sesame seeds split, releasing a pop and possibly indicating the origin of this phrase. Sesame seeds are used conceptually in Urdu literature, in the proverbs "til dharnay ki jagah na hona", meaning a place so crowded that there is no room for a single seed of sesame, and "in tilon mein teil nahee", referring to a person who appears to be useful, but is selfish when the time for need comes, literally meaning "there is no oil (left) in this sesame."